This book places international trade law within an economic,political and sociological context, contending that globalisation is characterised by both homogeneity and diversity. However, while implying changes within contracting parties, globalisation only results in a 'thin' homogeneity. Furthermore, globalisation is the result of the interaction, negotiations and policies between states. From this perspective, the book attempts to explain trade policy as resulting from domestic factors. Thus, if globalisation is characterised by diversity, how do such differences affect the trade policy of states in an era where nearly everything is subject to commerce? 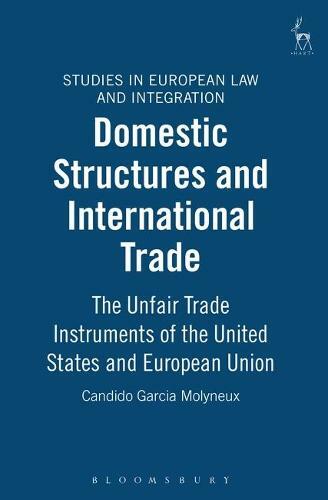 The book focuses on the US and the EC, analysing different institutional and substantive aspects of unfair trade instruments, such as anti-dumping and countervailing measures and market access instruments. Domestically, it focuses on both constitutional and socio-economic constraints. The book considers political action prescribed by formal constitutions in a wider socio-economic context, rejecting the a-historical and structurally blind normative idea of free trade.